Single duct reduced point Variable Air Volume Controller with brush less, constant torque, position feed-back actuator. 16 bit analog/digital converter, with 2 universal inputs and 2 triac digital outputs. With drift-free differential pressure sensor. 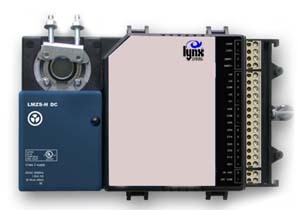 Direct serial communication with the optional LC-SMART-VAV. NiagaraAX Framework Wizard for configuration and monitoring of device available free of charge.